Butter chicken is one of the most popular Indian food recipes. It must be the most ordered food in almost all Indian restaurants. Have you ever wondered how easy it is to make it yourself? Well pretty easy as it turns out, and with a recipe as original as this one, amazingly good. Don’t let the long list of ingredients keep you from making this flavorful Indian dish because this butter chicken recipe is actually quite easy. I have included my friend’s recipe for the tandoori masala mix. It is absolutely delicious and very easy to make. If you are an Indian food lover, it is worth it to have this mix on hand in a sealed jar. One batch makes several batches of butter chicken and it can be used in many other Indian recipes as well. I’d love to hear your comments below if you try it. Let me know if you love it as much as I do. Wash the chicken and cut the pieces into 1 1/2 inch cubes. Dry the chicken pieces and set them aside. Mix all the ingredients for the marinade and adjust the level of salt if you need to. Add the chicken and mix it all together well. Refrigerate the mixture for at least 1 or 2 hours (preferably overnight for best results). When you are ready to cook the meat, preheat the oven to 375°F. Arrange the chicken in a shallow baking dish. Pour all of the marinade over the chicken. Bake, partially tented, for approximately 20 minutes, basting it once or twice with some the marinade or a bit of oil if the marinade has been absorbed. While the chicken bakes, prepare the sauce. In a sauté pan heat the oil on medium-high heat. Add the cumin seeds to the oil. When the seeds begin to sizzle, add the onions and continue to cook on medium-high heat until the onions are slightly browned. Add the tomatoes and all of the spices. Lower the heat to medium. Cover and cook the sauce for 10 to 15 minutes until it is slightly thickened. Add the butter and stir until it is melted. Add the cream and bring to a boil. Add the chicken and stir it all together gently until everything is well mixed. It's ready to serve. You can garnish your butter chicken with slivered almonds just before you serve it if you want. It looks nice and provides a great bit of crunch when you eat it. 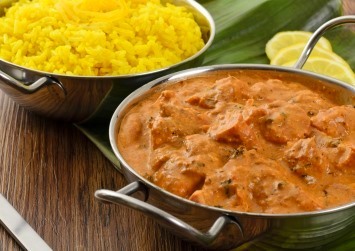 Butter chicken is wonderful served with hot naan bread or paranthas or ladled over rice. Try it with Indian pulau rice. Butter chicken is usually served in boneless cubes in most restaurants, so that is what I have indicated here. Of course you can use bone-in chicken pieces if you prefer. Many home cooks and chefs agree that bone in meat is more flavorful. Breast meat will cook faster than the dark meat, so adjust your cooking time according to what type of chicken you are using. The chicken and sauce can be prepared separately ahead of time and refrigerated for up to two days. Do not add the butter and cream to the sauce until ready to serve. You can buy a prepared tandoori spice mix, or you can use this recipe to put together your own version. If you love Indian food, make your own and have it ready for any time you crave that unique savory flavor of Indian. You can adjust the seasonings to get the exact flavor you prefer. Place all spices in a bowl and mix together well. Store any unused spice mix in a sealed container for future use. It will keep well for several months. This recipe makes about 1/3 cup. You will find more fabulous and authentic Indian recipes here, including samosas and vegetable dishes for a complete, delicious Indian meal. If you like this recipe, please take a moment to Pin it to Pinterest, Tweet about it, Like it on Facebook or leave a comment below. Thanks a lot. You can also submit your own recipe below in the comments section because I would love to help you share your creations with the world.